Sometimes a break from a long vacation provides the perfect intermission. 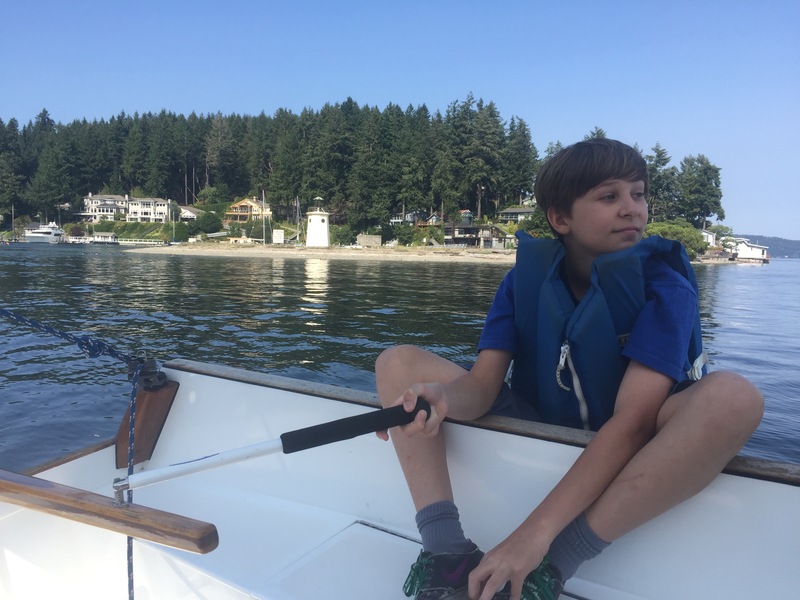 A few days after Jody returned home to Gig Harbor, I made it back (via ferries and the bus) to catch up with family and do some sailing with my 11 year grandson, Milo. Thanks to a generous friend who keeps a lovely Cat-rigged sailboat moored in the harbor, we got to enjoy a few days of awesome sailing. Add in a couple of bicycle rides and some mini golf, the fun part of the week was over. I spent the next few days pulling weeds from the garden and flower beds, washing windows and general house cleaning. The way I seen it, that earned me another couple weeks of vacation. Flying wives is a term sailors use to show their affectionate jeoulsy for those fortunate (or lucky) enough to fly in/out of the primo cruising locations. This is Jody's seaplane as she departed from Cortez Bay to get some grandkids time. For me, that means a dinner alone prior to a 5 am wake up to raise anchor and single-hand Huzzah 20 some miles south to a protected marina. Now secured, I will take two ferries, one taxi and one bus to get to Port Angeles where Jody will collect me and drive me home. Why? Be with Jody & hang with my grandsons, of course! And Hazel too! After a month on the boat, this is like an intermission. I'll get a few miles on the bike, Do some harbor sailing with my grandson Milo who's a fresh sailing school graduate, and who knows what else??? Huzzah will be fine for a couple weeks. Cheers! Our most recent stop was to Drew Harbor, Rebecca Spit & Heriot Bay, on Quadra Island’s east side. We anchored in Drew Harbor, which gains its protection from Rebecca Spit to its East. Rebecca Spit has the most amazing collection of driftwood and logs covering its shores I’ve ever seen and RVers come just to see it. Heriot Bay is to West, crowded with dozens of cheap fiberglass boats that make anchoring there impossible for visitors. But it has a decent marina, resort, pub, and RV park (and showers) on its south shores. After the Octopus Islands, we were looking for a dinner out and the Pub sounded great. After a couple sleeves (pints) of beer and the big serving of fish and chips, we were full! With locals pouring in for the live music, we retreated to the boat for another restful night. The following day we got a chance to stretch our legs a bit more with walk to the island’s largest food store. Not that it’s big – it’s not! Living here in the islands would be a difficult adjustment for most mainland folks. Later that day, a fellow sailor from the anchorage that had recognized Huzzah from a few different harbors over the prior weeks’ stopped by in his dinghy to chat. That afforded us another chance to meet some delightful Canadian sailors over sun-downers in the cockpit. A peaceful anchorage well worth the visit! This was our first visit to this Marine Park, and we were rewarded with amazing sights, abundant wildlife and unreal serenity. To reach the Octopus Islands on Quarda Island’s NE corner, you need to transit at least one of the four rapids at Surge, Hole in the Wall or Upper & Lower Okisollo. For some, rapids are a just too dicey to deal with, so they pass on the amazing opportunities the northern destinations offer. All the better for us. No noisy boaters here. Four larger islands shield the anchorage from Okisolllo Channel, and a dozen large rock formations are scattered throughout the NE side of the park to keep navigating interesting. We prefer to keep Huzzah pointed into the evening breeze, so we anchored in Waiatt Bay, with a city block of room between us and the next boat - a huge contrast to the lower islands. This place is so calm, you can hear your ears ring and you might even think your keel was stuck in the mud after a while. Two days later, we pulled our anchor (almost in unison) with the half-dozen or so boats headed to slack water at the rapids, and headed south again to Rebecca Spit & Drew Harbor. The weather this trip has been awesome, with temperatures in the mid 70’s to high 80’s almost every day – and no rain! While it's true that most of our cruising experience is self contained and without the amenities we take for granted at home, there are a few exceptions. Gorge Harbour Marina Resort BC is the best exception we've found in this otherwise desolate place. White motor vessels line the docks, row after row, where plentiful electrical power and water are available. Ashore, well trimmed lawns and gardens surround a quality restaurant with a stunning view of the docks and harbor. The resort also includes the nicest bathrooms, showers and laundry room we've seen in Canada this trip! Oh, I forgot to mention the hot tub and swimming pool. Jody's still bummed we couldn't use them as they don't offer day passes when they're in high season. We enjoyed Happy Hour and Tapas on the restaurant deck for my birthday. Wonderful food and a great setting all made the $76 "mini meal" seem worth it - somehow. The couple that sat next to us is the Editor/Publisher for Waggoner Cruising Guides, and said that $3 CDN per foot is the new normal for marina moorage north of Lund/Westview. Ouch! Makes expensive anchors and chain a good investment. We're off to the Octopus Islands. I doubt we'll have cell coverage, so we'll connect back in a few days. Like is good aboard Huzzah! After our memorable sail down Waddington Channel and a good night's sleep behind us, we had to start fixing things. First up was to free Huzzah's propeller from the prawn trap line. Unfortunately, I've been too lackadaisical about contingency planning since our return from the tropics, and left all my SCUBA kit at home. Doh! Being stuck in a popular harbor like Prideaux Haven can be a blessing if you're looking to bum tools or parts from other boats, so I slipped into a kayak and paddled to the closest boat. "Ahoy skipper", I called out. When the captain looked over the rail to see what the noise was, we immediately recognized each other from our local sailing community. Turns out, Dale and Diana from M/V Croys Creek are our neighbors in Gig Harbor, and had everything I needed. Always nice to start a project with a bit of luck. Twenty minutes later, the rope was freed from the prop, and we had an invitation to happy hour. Another great example of the cruising culture. The dinghy repair was next. The foredeck provided a decent work platform, but such a gnarly hole was quite difficult and required lots of sanding, chemical wipes and multiple coats of two-part glue with precise drying intervals. After completing the patch, you have to wait 24 hours until you can inflate the boat to see how well you did. I can report the patch is still holding and we're being uber careful with the dinghy these days. We try not to stay anywhere more than a few days, so were off to another harbor we've never visited. The lyrics from Bobby McFerrin’s pop hit; “In every life we have some trouble, But when you worry you make it double, Don’t worry, be happy” was going through my head last Wednesday as everything was going wrong aboard Huzzah. And while we all have bad days now and again, this one was a doozy! Ours troubles began in the morning while landing the dingy ashore at low tide. We misjudged our approach and punctured the dinghy’s front air chamber on a razor sharp oyster shell. After limping back to Huzzah and preparing to patch the dinghy on the foredeck, the wind shifted to the south and began to increase rapidly. This exposed Huzzah broadside to wind and waves entering the harbor, which is unprotected to the miles of fetch down the channel. On this day, we had stern-tied the boat to the shore due to the extremely deep water here (as we often do), which puts a lot of pressure on the anchor & stern lines in big wind and waves. After a period, the stern line chafed through on a rock and snapped. Fortunately, the anchor held and we were in no immediate danger. But Jody didn’t like the wind and wanted to move on. So at 3 pm we pulled anchor and motored south down the channel to collect the prawn traps we had set earlier. Bad luck comes in three’s right? Without the dinghy, we needed to pull the prawn traps from the stern of Huzzah. Not too difficult, but while hauling the 300+ foot lines, one slipped overboard and got wrapped in our propeller. With Huzzah’s main engine gone, we now we had raise sails in the narrow Waddington channel and sail upwind against two knots of adverse current. We sailed for the next few hours in a brisk breeze until the wind suddenly died. Now we’re totally becalmed, the sun is beginning to set and we have no wind, no main engine and no dinghy to tow with. With my best attempts to ease Jody’s anxiety that we wouldn’t drift onto a rock strewn shore having failed, I went to my next plan. With the dinghy already on the foredeck, we experimented with sticky-back sailcloth and some Boeing Surplus reinforced tape to temporarily patch the 5” slit well enough to hold a little air and keep the sea water out. The surplus tape worked, so we launched the dink and mounted the outboard. By now an hour had passed and the late evening breeze could be seen filling in. Hip hip Huzzah! We were able to sail to the entrance of Prideaux Haven anchorage at dark, strike our sails and side-tow Huzzah in with Jody driving the dinghy. With the anchor down at 10 pm, Jody says, “what do you want for dinner – I’m not cooking”! No problem, sailors always have a can of chili in the bilge for such occasions. It's always fun to gather seafood while exploring new cruising destinations. So this trip we loaded our shrimp pots, 750 feet of line and the stinky bait and went prawn fishing (trapping really). Without my buddy Harry aboard Sea Eagle (he’s a fishing Legend) to show me his secret techniques, I wasn't confident. But with beginners luck, we caught a few dozen of the largest prawns I've ever had! Life is good aboard Huzzah. Cruisers’ tend to look out for one another when cruising in remote locations. The more remote you go, the more caring boaters seem to be. I believe it’s because most discourteous boater types just don’t travel this far. You know the type; the skipper that doesn’t even know basic navigation rules so they just pretend they don’t see you as they cut right in front of right-of-way vessels. They’re just too important or busy to travel hundreds’ of miles to reach Desolation Sound in BC Canada. If they could make it, that is. And that’s good, because they couldn’t (or wouldn’t) help anyway. And that’s exactly why we come here! So when you see that help is needed - you offer. It’s that simple. When Jody & I saw a tender (a larger version of a dinghy in yachtie speak) left stranded in a small pool of water that surrounded the gas dock outside Squirrel Cove, we took notice. With the tide still going out and the surrounding beach dry, we knew the best efforts of two people digging away with clam shovels was futile. After snapping the picture above from the nearby commercial wharf, we proceeded down a dangerously steep ramp to our dinghy. Once aboard, we hailed to them that we would be happy to give them a ride to their boat until the tide came in – and back, of course. And that’s how we came to know John West and his granddaughter Maya from the motor yacht Falcon, from Fox Island, WA. How ironic to help neighbors 300 miles from home! Ah, just another day of cruising. My title is a word play on that famous AC/DC song we all know; “Dirty deeds done dirt cheap”. Life is good aboard Huzzah! Our trip north through the San Juan and Gulf Islands has been uncharacteristically cold for July. The winds have been light as well, absent the thermal sea breeze that normally accompanies warm weather. After all the warm weather in June, I guess that’s to be expected. That all changed yesterday! With a new high pressure system over the mid-Vancouver Island, the winds piped up big time. That also means big waves in the wide-open passages like the Strait of Georgia. Yesterday morning at 4 am we were awoken by the sounds of the wind howling thru our rigging while moored in Schooner Cove marina. With the forecast predicting even more wind in the coming days, we chose to make a run for it – bashing NW through the Strait under power. With only an occasional wave breaking over the bow, we managed fairly well. Sure, the boat is covered in salt spray and the windows are almost opaque, but no sea water on decks. And while it was only blowing 15 knots, the fetch turns even that modest wind into 2-3 foot waves. Then it happened! Right in front of Huzzah a HUGH whale broached the surface and did a stunning tail-slap. So close was the Humpback, I had to stop the engine rather than grab my phone to snap a pic. A few minutes later we saw the Cow and Calf 100 meters astern, out of camera phone range. Oh well. After eleven hours of motoring (~80nm) we’re now anchored in Desolation Sound’s Squirrel Cove. And we’ll likely be here for days! The title, which was loosely meant to be a double entendre, reflects the wind, waves, and whale spray sightings. Not a bad day for a retired couple cruising in their boat. After ten months away from cruising, Jody & I are aboard Huzzah again. Once the bottom painting and launching were complete, we began the arduous task of getting everything in place for our annual cruise north. Ten days later we were (mostly) ready to go. And while that sounds like a long time, it's not to bad considering we'll be aboard for two months. I tend to the equipment and systems, while Jody plans and prepares the food and provisions. She does a lot of time-consuming pre-packaging and pre-freezing of our favorite foods, something we are always thankful for. While we had originally planned to travel 1,800 miles to Alaska and back this year, our new reality has us doing a modest 700 mile round trip with a focus on short days and plenty of stops at marinas for our needed exercise. 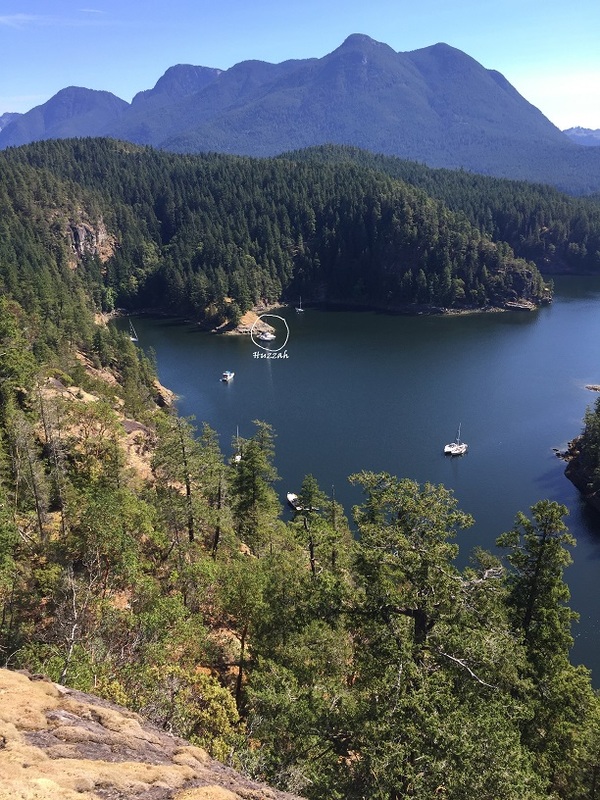 Our yacht club membership pays dividends here as most of our stops in the San Juan and Gulf Islands are free! After departing Gig Harbor we spent our first night in Port Ludlow, which positioned us well to make an easy crossing of the Straits of Jun de Fuca the following day. It was an exceptionally clam day and we made good time allowing us to set our hook in Roche Harbor well before happy hour. The harbor was packed for the Fourth of July fireworks show, so I didn't sleep so well that night. Afterwards, we continued north to Prevost Hbr. for the night, allowing us a wonderful 4 mile hike on Stuart Island the following morning. We then cleared customs into Canada's Gulf Islands. After stopping at the farmers market at Ganges Hbr. for some fresh greens, we finally had our first epic sail north in a fresh southerly with the Code Screecher flying. I think Jody's smile from the helm says it all. To me, doing yard work is like going to the gym. It’s an awful lot of work for the few fleeting moments of positive feeling you get from doing it! But unlike going to the gym, the yard work I’m talking about doesn’t improve your health one iota. In fact, I wear protective eye wear, clothing and a respirator to minimize the health risks associated from doing it. And it’s much worse than pulling weeds, spraying Roundup or spreading beauty bark! I’m talking about the boaters’ ritual of hauling our boats out of the water every few years for a bottom job. For those that have never seen it, a huge machine slips two straps under Huzzah and plucks her modest 28,000 pounds from the sea and deposits her on land. Then a guy pressure washers the sea slime and critters from her bottom before she’s relocated to a large sheet of black plastic 20’ wide and 60’ long. She sits on her keel with 8-10 metal stands positioned around her to ensure she doesn’t fall over while I sand the underwater surfaces and re-paint them with $300 a gallon copper paint. Everything about copper paint is toxic, and the Department of Ecology is trying to ban it. But for now however, it’s the only thing that works. So we all don our protective gear and a use special sander with vacuums to collect as much copper dust as possible. The real yachtie types with money hire this work out, of course. But for us DIY’ers, we do it because we can and we save lots of $$$. But we hate it! So that’s what I did for three weeks this past June. The pictures show the net result, offer a glimpse into the dark side of boat ownership for the average boater. One of the special things about Desolation Sound is its geographical diversity. As equally impressive as the amazing sights we've seen in Mexico and French Polynesia, this is the cold water version of Paradise in our opinion. In the past few days we've anchored in deep water next to sheer wall cliffs, kayaked through tidal rapids into huge salt-water lagoons and swam in clean, clear lakes just a few hundred yards from shore's edge. 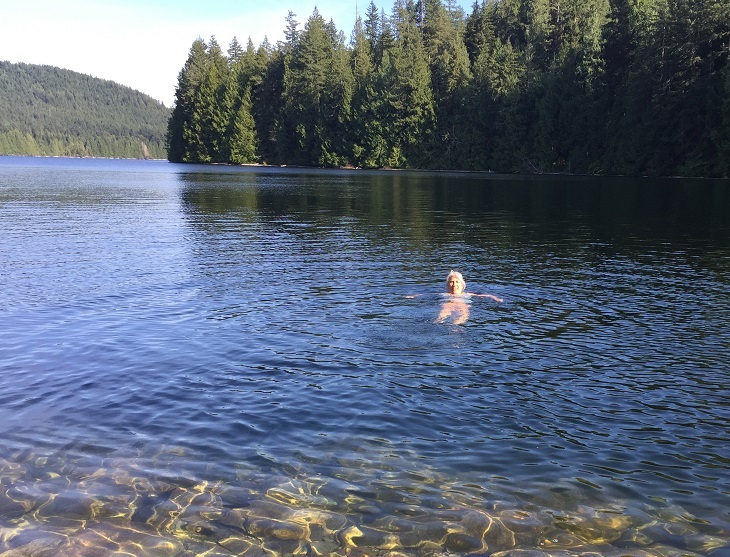 Below is Jody swimming in Unwin Lake at Tenedos Bay. For the next 22 hours, Huzzah is trapped at anchor here in Roscoe Bay, as the once passable entrance is now an almost dry, rock-strewn land bridge. This is my first time here, and despite the rain I love the adventure of it all. Apparently others' do as well, as the dozen or so boats anchored here seem to change frequently at high tide. For deep draft sailboats like us, that's at least a 11' high tide. And Roscoe Bay has its own lake a short walk from the harbors end, Black Lake. Today it's raining so we'll have to check out the swimming here on another trip. Cruising is about exploration and adventure as much, if not more, than boating. Don’t get me wrong, I love to sail. But we end up doing very little sailing while cruising in the PNW due to the narrow channels and seasonal wind patterns. And while long ocean passages are, well boring… motoring for hours on end through the inland passages here can be very stressful due to the plethora of logs, navigation hazards and inexperienced boaters. So the opportunity to get ashore and discover something new or challenging is something we cherish. 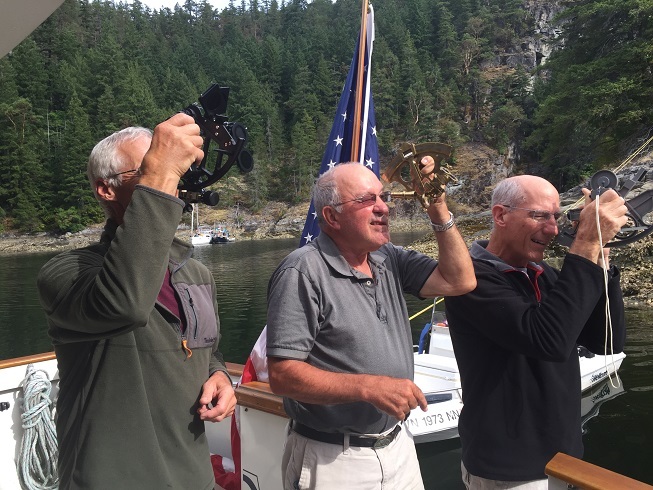 While in Tenedos Bay, Professor Harry aboard Sea Eagle pointed up to a Canadian flag atop a high cliff above our anchorage and said some old guys climbed up and put it there. I thought if they could do it so could we – right? Jody was unconvinced at first, but when fellow cruisers Bren, Clay, John & Kim wanted to go – we were in. The climb wasn’t easy, but no challenge worth doing ever is. Fortunately, some yachties’ have placed ropes in key places to make it less dangerous. And what a view! Cruising is always more fun when you can share, learn and enjoy the experience with friends. So Jody & I feel lucky that we've been able to connect with long time friends Harry & Sandie aboard their motor yacht Sea Eagle over the past week. Harry & I were fierce competitors in the Thistle Class racing dinghy 30 years ago, and he was one of the best sailors in the Tacoma area for decades. He now spends his energy catching fish and harvesting shellfish as he & Sandie cruise the waters between their home port of Gig Harbor and all the popular cruising grounds in Canada and Alaska. We're also cruising with our friends Bill & Debbie on Anakena whom we met during our South Pacific cruise. 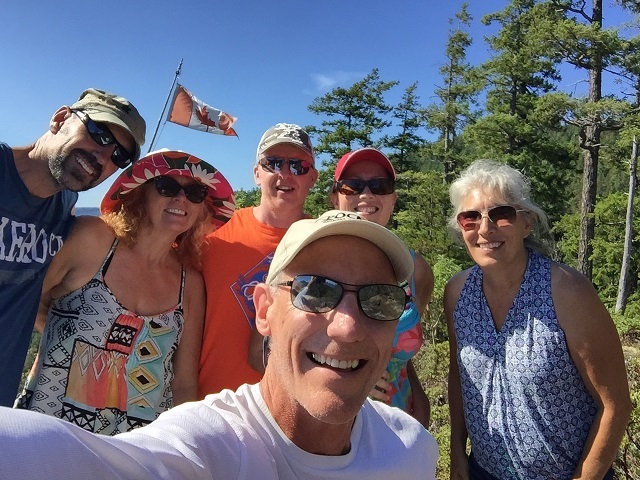 So it was special for us to be here in Desolation Sound, celebrating our 38th wedding anniversary with old and new friends. Eating fresh clams and drinking champagne in these absolutely gorgeous surroundings was every bit as special as Bora Bora was last year. We share meal preparation, happy hours and we each host dinner on a rotating basis. Last evening, Harry invited nearby boats in our anchorage for happy hour onshore at a place known as Harry's rock. You know you're there when you see a rusty metal sculpture of a large Dungeness crab with Harry's name on it! Harry can tell you how it got there. Anyway, fourteen folks enjoyed fellowship, sea stories and fresh cooked clams. You meet some of the nicest people on boats! 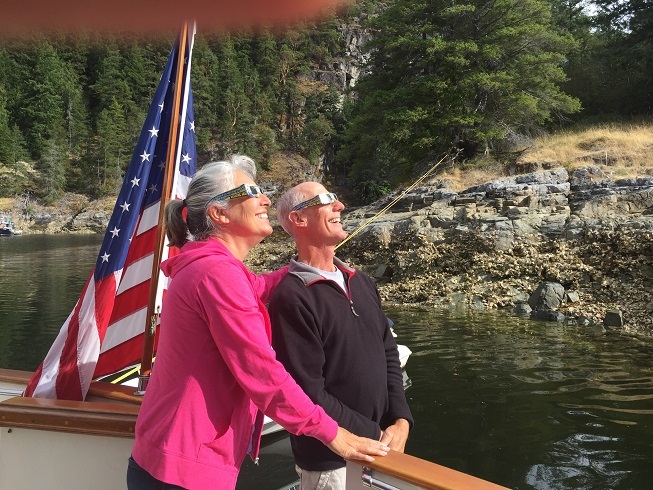 Today, we gathered aboard our mother ship, Sea Eagle, and gazed skyward to observe the solar eclipse from here in Canada. At 50° north latitude, it was only a partial eclipse, but we and everybody else anchored in Tenedos Bay was on their decks enjoying the event. Don't worry Mom, Jody brought special glasses, and we also took sun sights from the various sextants that surfaced for the occasion. Below are the three amigos; Bill, Harry & Gerry. What's next is unknown. We have no specific cruising plans, and we're dam well sticking to them! In early August, providence finally released us from our encumbered circumstances at home, allowing us to go cruising again. We did our usual run to Costco and the grocery store, cleared out our home refrigerator and began the process of loading Huzzah. I always think this step takes a couple hours, but it probably takes 3 - 4 times that long - much longer than I ever remember or plan for. Just locating all our cruising gear unique to the Salish Sea (like crab traps, stern-tie ropes, clam shovel, wool blankets, etc.) took forever. As it turned out, I failed at this and left both sets of my freshly cleaned foul weather gear at home! Oh well, I haven't seen any rain since returning from Hawaii anyway. How ironic is that? After a full day of loading Huzzah at the Jerisch public dock in GH, we finally departed under a formidable layer of smoke that limited our visibility to just a mile or so as we motored in flat calm water. As veteran NW cruisers, we know a thing or two about fickle summer winds, and since there's no fuel dock in Gig Harbor, our first stop was Des Moines Marina. From there, we motored north, spending our first night in Blakeley Harbor, before arriving the following day at our favorite crabbing hole at Garrison/Westcott Bay on San Juan Island. 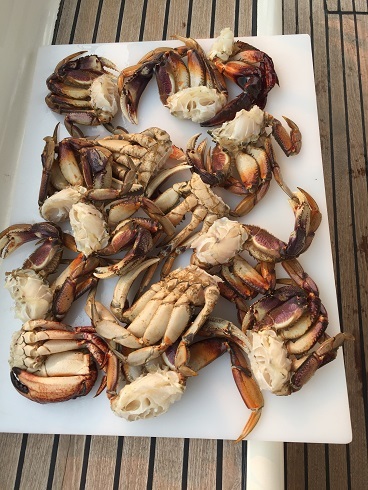 After catching our limit for two consecutive days, we'd had enough crab and moved on. By this time the Westerly onshore winds had returned to push the forest fire smoke inland, a welcome respite for Jody. Our biggest surprise was how cold the westerly winds coming off the ocean were! While the radio talked of record setting high temperatures, we were bundled in fleece as we traveled the sound. Fortunately, once we move north of the San Juan Islands, things did warm up considerably. After Garrison Bay, we spent a couple nights in Roche Harbor which afforded us comfy showers and Gerry an invigorating bike ride around the Island. Eventually, we connected up with friends cruising on a parallel schedule, while regrettably missing others that were on their way home already. Prevost Harbor on Stuart Is. has always been a favorite stop for us, and this year we met up with Bill & Debbie there and did the 4 mile hike to the Turn Point lighthouse. The following morning we departed for Sidney BC to clear customs into Canada. We were dreading the fact that we had more alcohol aboard than planned (after only spending 5 days of our month trip in the US), but were pleasantly surprised when Canadian officials said no problem! While in route to Sidney, Gerry found a log off Forest Island that damaged the speed sensor as it rolled along the bottom of Huzzah. I was so appalled that I severely reprimanded myself with lots of sailor language. Hopefully that's all the damage, but a dive will be needed to confirm that. From there we visited the beautiful Butchart Gardens on Tod Inlet, then Ganges, Nanaimo and finally arriving in Desolation Sound. The trip has not been as smooth as expected due to sporadic displays of poor judgment by the captain which has resulted in a punctured inflatable dinghy and a damaged sail. Even this cannot diminish the sheer beauty and solitude of this area, or the fellowship with friends, eh! Since arriving back from Hawaii on June 23nd, life has quickly returned to the previous normal. Medical appointments, car maintenance and appliance repairs consume our days, albeit in slow motion. Schedule, wait, another delay, and then repeat. If people think boat repairs are expensive, have Sears fix your refrigerator! It took two weeks to fix ours with a $120 part that took 20 minutes to install at a cost of $680! To me, it felt like our cruising days were over! I could see Huzzah at anchor in the Harbor from our deck, but we had so many things keeping us from setting sail. The blessing this time afforded us however, was the opportunity to spend more time with family and friends. We spent a weekend doing some crabbing in the skiff with Valerie's family, and Rose & her family were able to join us aboard Huzzah for a night in Quartermaster Harbor for Independence Day fireworks. A couple of weeks later Jody spent a week in Portland assisting Rose while she was recovering from hip surgery. We finally broke free of our domestic trappings in late July with a short cruise to the South Sound with grandson Milo. 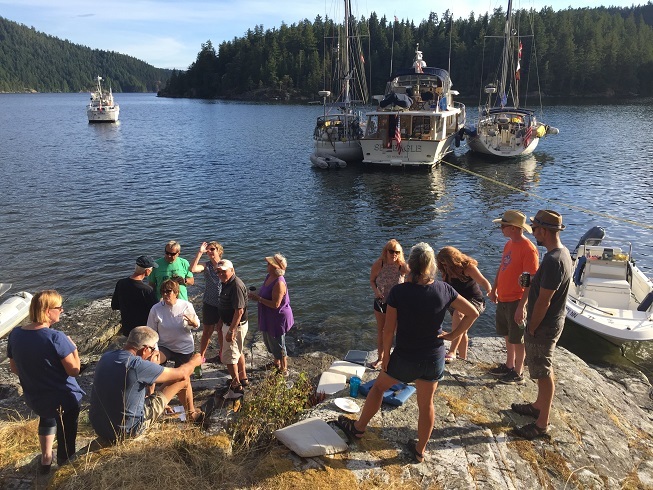 With stops in Filucy Bay, McMicken Island, Jerrel Cove and Olympia, we had a great time in spite of our failure to catch many crab. Milo is a good dinghy driver, so we did quite a few "Harbor Burns" as we call them, just motoring around. Life is good aboard Huzzah again! Our final day at sea was as spirited and challenging as any we've experienced during our cruise. Beam reaching in 25 knot winds and 10' seas with beautiful sunshine seemed entirely fitting for our final leg. Not even a huge wave that sent green water down the companion way hatch into the cabin could dampen our spirits. So, with a double reef in the mainsail, and a sliver of the genoa flying, we came charging into the Straits of Jaun de Fuca in the early morning hours of Thursday, June 21st - after 16 days and 16 ½ hours of passage! Hip Hip Huzzah! Yesterday greeted us with light overcast skies that soon burned off into beautiful sunshine. The gray sea became blue again and life was good! Life is fairly simple out here. So we put our fishing lines in the water and watched the miles disappear behind us. We finished the day with some awesome Mahi tacos, complements to Scott! Today is shaping up to be a repeat of yesterday. It seems ironic to me that the weather's improving as we approach the Washington coast, but in fact, we're just lucky to be sailing on the edge of a 1025mb high pressure system. Wind and sun is hard to beat! We continue to make good time in these favorable conditions. After almost 13 days on starboard tack (wind blowing the right side of boat) we're now on port. The seas are unusually small, and we have 10 - 14 knots of wind on the beam. We've covered over 300 miles in the last 48 hours, and we are now ~260 miles from making landfall at Cape Flattery. Sailing has been so easy lately, the only navigation I've done is to alter course this morning to avoid sailing over a shallow (33' deep) area of foul bottom called the Cobb Seamount. Our expected arrival to Gig Harbor is Friday afternoon - but anything can happen, so it's just an estimate at this point. Life is good aboard Huzzah!